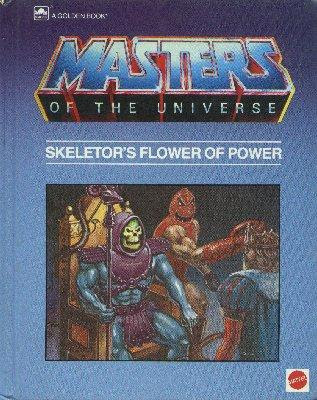 Skeletor’s Flower of Power is a 1985 Masters of the Universe children’s book written by Bryce Knorr and illustrated by Harry J. Quinn and James Holloway. Here, Skeletor uses “remote-controlled” flowers to control the people of Eternia and become king. The worst title of all time and a tired plot device badly executed – it should come as no surprise, then, that this is one of those stories where things just happen without regard for making sense, plausibility, or contrivance (of course that giant inflatable monster randomly bouncing around the palace is the king of his people!). Maybe – just maybe – this would have worked as a cartoon episode (not a good one, for sure), but as a book, it fails. The two artists have different, clashing styles. Some pages are exceptionally good; most are not. The characters are frequently out of proportion, and often look like whichever artist responsible just copied the action figures (ridiculous proportions and all), then tacked on the faces. And Orko’s arms are so long that he makes the leap from comical to extremely creepy (he’s also “walking” – blame Knorr for that). You can’t go right with slapdash art and writing that doesn’t respect children’s intelligence.